Below is a series of images of the Overs rebuilt CFIIIs with accompanying text. 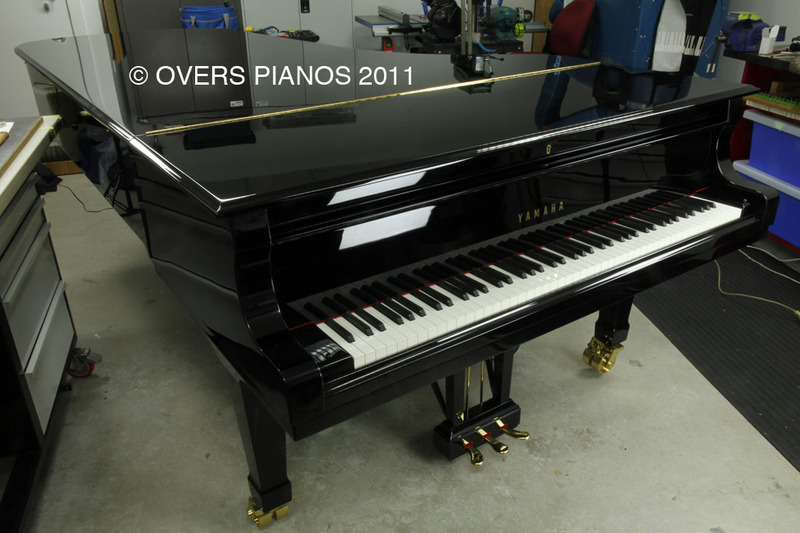 This piano was recently rebuilt and is for sale for the FOB sum of A$116,000 (plus 10% GST for Australian customers). This concert grand was rebuilt with design improvements which are consistent with Overs' new grand pianos, including a revised bass scale (first designed by Ron Overs for a rebuilt Steinway model D in 1989 and has been used many times since - this Yamaha CF has the same bass-section speaking lengths as a Steinway D). Overs revised the soundboard impedance to improve sustain, and the treble-section string terminations have been revised (shortened) to improve tonal clarity. The action was fitted with a set of custom bored and balanced Abel premium hammers during its extensive rebuild. This instrument looks, feels and sounds like it is in absolutely new condition inside and out. 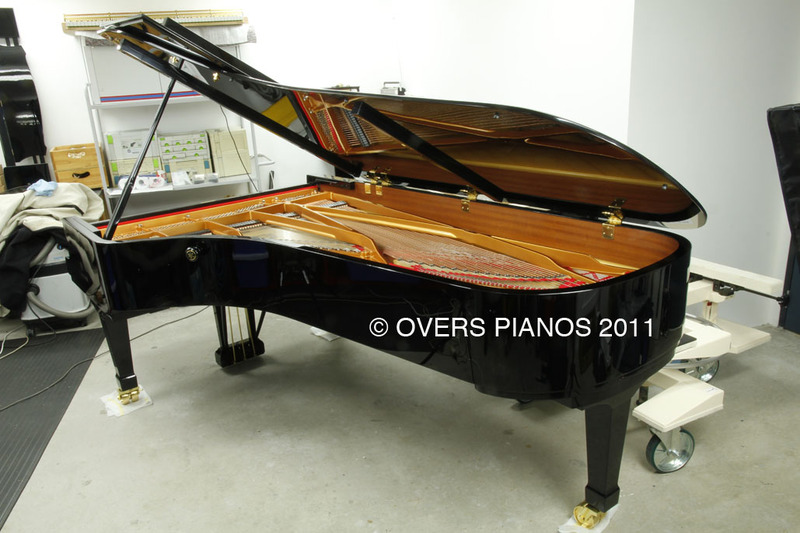 While this is not a cheap piano compared to other rebuilt concert grand pianos for sale, it is an absolute bargain when compared to new concert grands from the serious manufacturers. 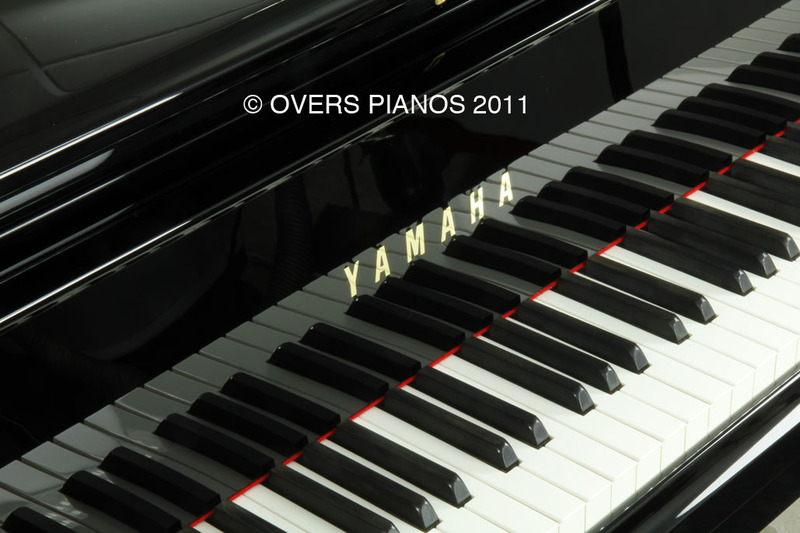 No piano image porfolio would be complete without an image of the fallboard face and keyboard with brand name. This overview image shows the flatness of the top lid. The teardown during the rebuild includes everything, including the pedals, the bass board under them, and the pedal pivot bushings within. 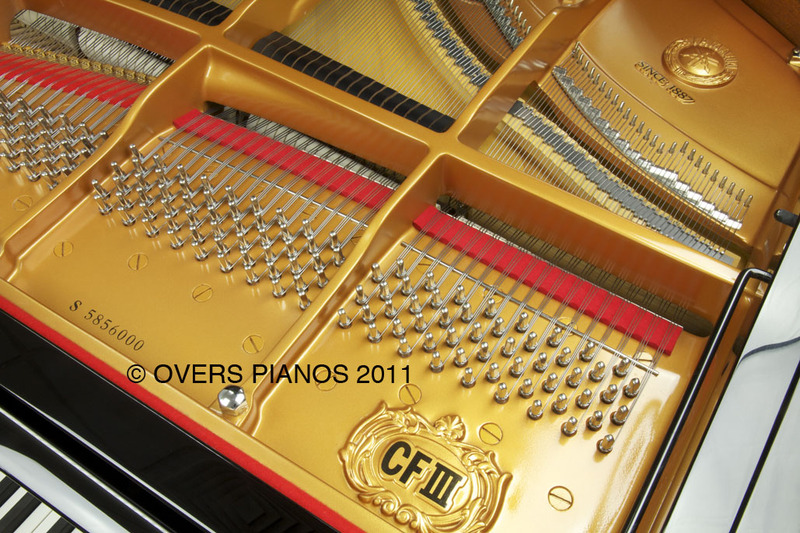 The finishing includes the under side of the lids, which are cut down to the same standards as the outside of the piano, and polished to the same level of finish. This makes for some impressive reflections of the inner parts of the piano when it is properly lit for a concert. 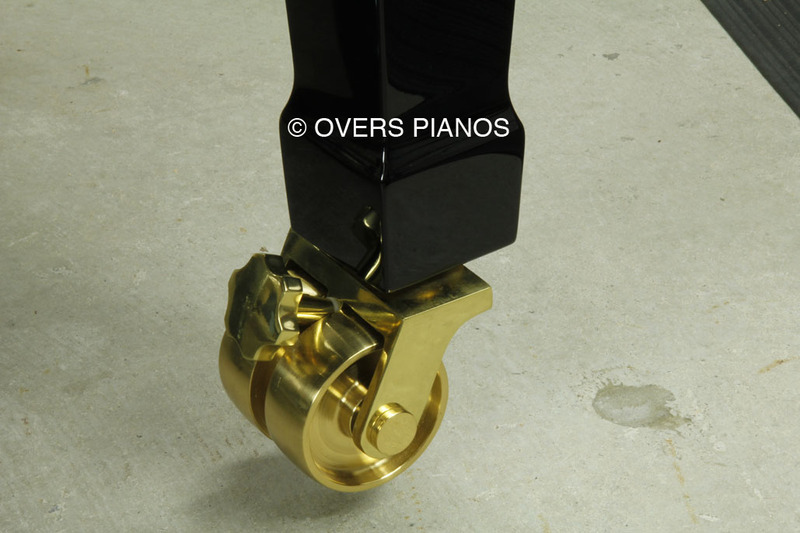 The castors are supported by foam to prevent floor damage. Overview image of the inside of the piano. This image shows a view of the top two treble string sections. The factory front duplex bars have been cut out of the piano. A ground-stock profile is shaped to a V, hardened and Electroless Nickel (EN) plated. The EN plating makes for a very good low friction surface which is corrosion resistant. EN plating is used extensively in the aeronautics industry to prevent corrosion. 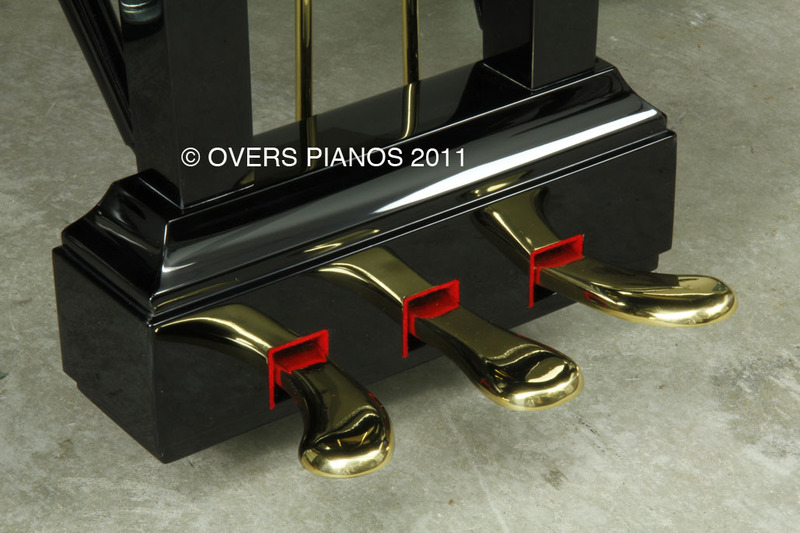 It is just as useful when it comes to pianos. A close view of the new continuous V bar, with a rounded counterbearing bar set back towards the tuning pin fields to reduce the loading on the felt. 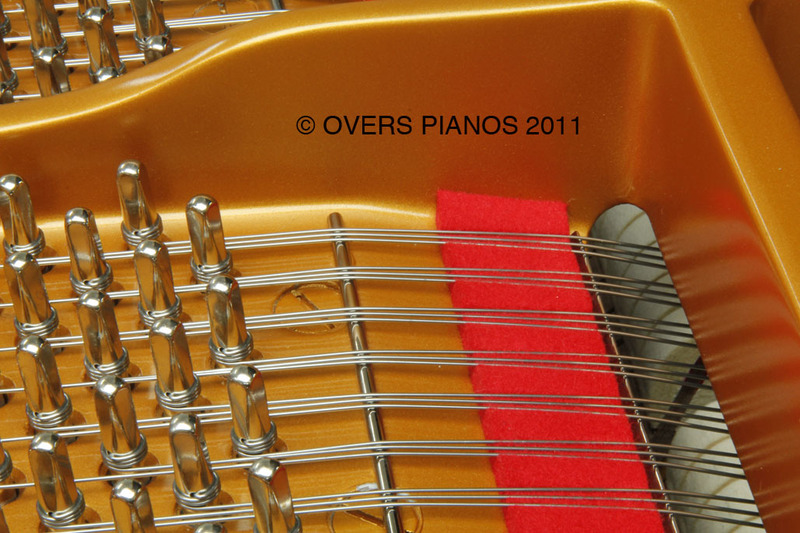 This approach helps the piano to be as tuneable in five years as when first restrung. When the string is allowed to bear on the felt with full pressure it tends to grab the felt as the wire gets older, making string rendering (and therefore tuning stability) difficult for the tuner. The benefit of the continuous V bar is that the front counterbearing lengths are kept as short as possible. This helps to produce a cleaner treble with less string noise. The so called 'tuned' front duplex system could have been retained, but it always will be a noiser system, and it makes the job of the voicer a little more difficult. There are absolutely no benefits in retaining the original front duplex design, if one is interested in improved acoustic performance. 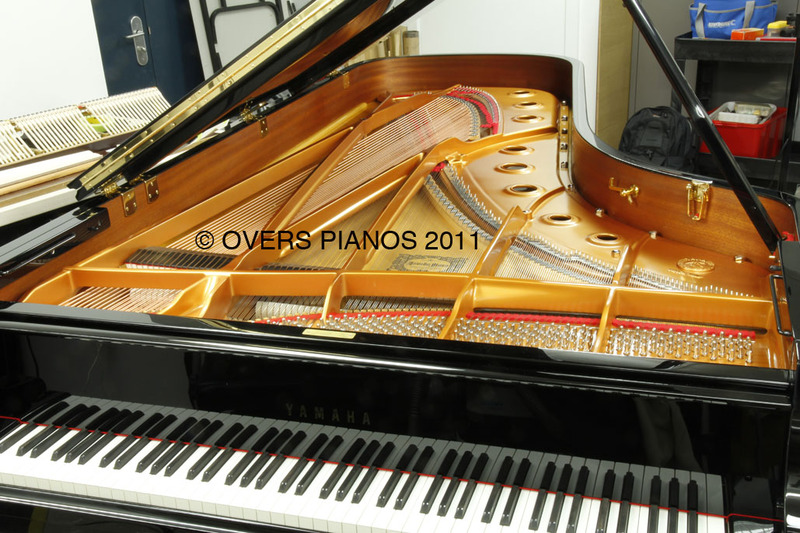 VISIT OVERS PIANOS WEBSITE - if you didn't get to this page via Overs Pianos' site.